I don't know, you wait ages for a reprint of a favourite author & then three come along at once! After posting about Ursula Bloom on Thursday, I was pleased to hear from a friend in the D E Stevenson Yahoo group about the reprints of Elizabeth Cadell's books. Her grandchildren have started Friendly Air Publishing, & will be releasing Cadell's novels as eBooks. The first three are The Corner Shop, The Fledgling & The Cuckoo in Spring. 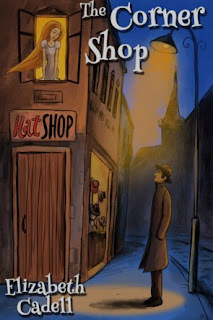 I can't really say that Cadell is a favourite author as I haven't read any of her books but the reviews I've read around the blogs - such as the review here of The Corner Shop - make me think that I will enjoy her books. I'm not sure if I've mentioned the eBook reprints of D E Stevenson but Endeavour Press have started to release some of her books with hopefully more to come. Stevenson fans have much to enjoy with paperback reprints already from Persephone, Sourcebooks & Greyladies. Endeavour Press are also reprinting Marjorie Bowen. Does anyone else remember her? I have vivid memories of reading her biography of Mary, Queen of Scots over & over again but she also wrote historical fiction & ghost stories. Endeavour have also published an eBook of Angela Thirkell's historical novel, Trooper to the Southern Cross, not one of her Barsetshire novels but the story of a journey to Australia on a troop ship. More in the nature of forthcoming excitement, I'm very much looking forward to Scott's new venture in the world of middlebrow publishing. Scott blogs at Furrowed Middlebrow & he recently announced that he's about to begin his own imprint to resurrect some of his own favourite authors. There may be some clues in his own Possibly Persephone list here but several of these are back in print already. I would love Winifred Peck to be on Scott's list. I loved House-Bound (Persephone) & have enjoyed Scott's reviews of several of her other titles. I haven't heard of Elizabeth Cadell, but The Corner Shop sounds charming. And I'm very interested in Angela Thirkell's Trooper to the Southern Cross (though the non-Barsetshire books I've read have been a mixed bag). I think she can be compared with D E Stevenson although, as I said, I haven't read her yet. I'm trying to read the Thirkells I already have so I probably won't rush off to read Trooper just yet although it does have an Australian connection. She's one of the authors I used to read in the days when I did more browsing in the library (rather than spending time in the electronic catalog)...from what I remember, I think anyone who likes D.E. Stevenson would enjoy her books! Good, I'm glad you've enjoyed reading EC. I wonder if she's related to the Scottish painter? I think that's what we miss when we don't browse in bookshops or libraries, that serendipitous discovery because the cover is attractive etc. I'm guilty of not browsing enough myself, especially now that I don't work in a branch anymore. Grrrrr.......e-books again! However, I think you will like Elizabeth Cadell, as she was a good storyteller. But like many lady novelists of the 50's, she had difficulty adapting to the changed social climate of the 60's, so I think her earlier books are better. I just hope paperbacks will follow the e-books. Thanks for the tip, I hope the grandchildren choose her best books to republish first! Paperbacks do seem to follow if the eBooks are a success so fingers crossed. I am authorized by the family of Elizabeth Cadell to republish her books and we are putting them on paperback and audio as well. Watch for them to come out soon. We have 7 listed on amazon kindle for now. That's good news about the different formats. I think the paperbacks will entice even more readers. Thanks for letting us know.